What's Next in Local Government? What will drive the direction of local government during the next decade and beyond? What big ideas will transform our communities into great, sustainable places to live, work and play? 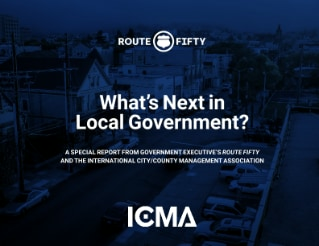 This e-book, a special report from Government Executive’s Route Fifty and the International City/County Management Association (ICMA), features the rising stars and big ideas advancing local government now and in the future.